Kindle users, included in the book is a link to a free printable PDF of every picture as a free bonus for you to enjoy. Purchase this book today and receive another original bonus coloring book worth $2.99 that you can download and print for free! This book contains unique black and white designs, illustrations, and patterns of hearts and loving phrases for you to color and enjoy hours of mindful relaxation and stress relief. Coloring as an adult can bring a peaceful calm to your mind as you focus your energy on a single creative expression while letting the stress of the day fade off into the distance. Take a moment just for yourself today and welcome some inner peace into your life by indulging in a favorite pastime. Use the included PDF file to print out the many detailed and funny pictures in this book on some high quality 8.5 by 11 paper and let your creative juices flow. When you’re finished, you’ll have many display-worthy drawings that you’ll want to share with your friends. Coloring as and adult has many proven benefits backed up by science. Spending time coloring has been shown to reduce stress, promote mindfulness, and improve mental clarity and focus, and even provide a lasting benefit to one’s memory and cognition. Coloring patterns can help us to achieve a meditative state. In fact, many people find it easier to achieve this state when coloring than they do when actually trying to meditate. This is probably because meditation involves a deliberate effort to detach the flow of thoughts from the concept of the self. Doing so requires a deliberate focus and effort on the task at hand which can actually serve to make achieving the desired result more difficult. Many adults who color report being “lost” in the simple act of coloring and becoming detached from the flow of thought and time, easily achieving higher orders of meditation than they ever had before. 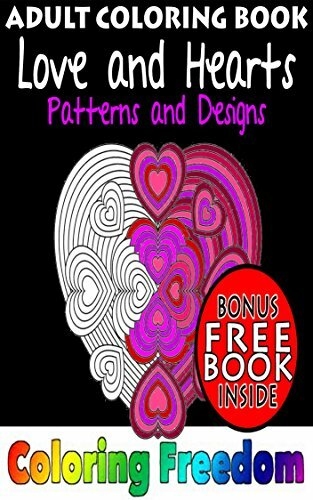 Scroll up to grab your copy of Love and Hearts patterns and designs for meditation, stress relief, relaxation, therapy, and fun (Books for creative adults) and enjoy hours of entertainment and relaxation for this limited time promotional price!